This novel is for everyone who has ever studied any monstrosity of history, with the serene satisfaction of being horrified while knowing exactly what was going to happen, rather like studying a dragon anatomized upon a table, and then turning around to find the dragon's present-day relations standing close by, alive and ready to bite. 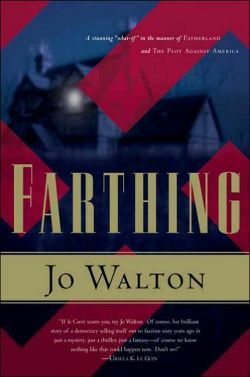 Farthing, by Jo Walton, is an English murder mystery set in an alternate history universe. In the world of Farthing, several months into the Battle of Britain, prior to Germany's invasion of Russia, a faction within the British Conservative Party successfully negotiated a peace with Hitler behind Churchill's back. The novel takes place in 1949, in an England that has learned to peacefully co-exist with the evil that rules the Continent. Farthing is the name of the country estate where most of the novel takes place. It is also the nickname given to the politicians who gather there, the "Farthing Set", who were responsible for making peace with Germany. As the novel opens, the Farthing Set is gathering at the estate for the weekend to prepare for an important party vote. Among the guests is Lucy Kahn, nee Eversly, the daughter of one of the more influential members of the group, and her husband David, a jewish banker whom the members of the set, including Lucy's parents, openly despise for his race. During the night Sir James Thirkie, the man who personally negotiated the peace with Hitler, is murdered. He is found in his bed, his shirt stained with blood, a knife protruding from his chest. He is pinned with a yellow Star of David badge, of the kind Jews are forced to wear in Europe. David Kahn is immediately taken as the prime suspect. The story is told from two perspectives. Chapters alternate between a first-person narrative written by Lucy Kahn and a third-person narrative focused on Inspector Carmichael, who is sent by Scotland Yard to investigate the murder. It's an interesting technique that allows the reader to get a more full view of the main characters, by letting us see them as others see them and as they see themselves. At times it's a little jarring, though never obtrusively so, to skip back and forth between two very different characters with very different styles. Mrs. Kahn has a highly prolix and discursive style. Inspector Carmichael's chapters have the matter-of-fact brusqueness of a police procedural. Both, however, are lovingly written and intimate; it is a tribute to how well the characters are developed that every time you finish a Carmichael chapter you feel vaguely annoyed to be leaving him for Mrs. Kahn, and every time you finish a Kahn chapter you feel annoyed to be leaving her for Carmichael. This novel is published by Tor, a science fiction label, and is to be found in the science fiction section at bookstores. Yet it is as much an English country house murder mystery as it is alternate history. The characters do not spend a lot of time chatting about the recent past; the events of the prior nine years are casually mentioned as they come up naturally in the course of the novel, but we are never plunked down to a history chapter on What Went Differently. The novel is written as a mystery novel first, and it is the murder that absorbs the characters's attentions throughout. Yet it would be inaccurate to say that this is simply a mystery novel that happens to be set in an alternate timeline. The alternate history is more than a setting, it's an important element in the novel's development and larger themes. The book isn't just science fiction and it isn't just a mystery; the two genres are so seamlessly integrated that classifying the book as one or the other seems to do it a disservice. The novel is rather brief, 320 pages in a hard-bound book with fairly large print, and makes for quick reading. The chapters are short, ten pages on average, and the story is absorbing. I read nealry the entire book in the course of a pair of several-hour sessions; I found it very difficult to tear myself away from it once I had gotten involved in it. Right now the book is only available in hardback, for a fairly steep $25. Nonetheless, it is good enough that I'd recommend the hardback edition as well worth the price. It was released fairly recently, so I don't believe a paperback edition is forthcoming anytime soon. A word of caution: The world of the book is frightening in its realism. Walton does an excellent job of showing us how we accomodate evil in our daily lives by showing us how the England of Farthing has just sort of learned to live with Nazi Germany in its backyard. She does everything very subtly, never jumping up and down or beating us over the head with it. The characters in Farthing, even the pure ones acting from righteous motives, never stop and say "I can't believe we've allowed this incredible evil to continue!" They just sort of accept it. Reading Farthing forces the reader to think hard about what sort of evils she might have just learned to accept, as though there were nothing wrong with them. In any case, Farthing is an excellent, thoughtful novel, well-written, and worth picking up. I highly recommend it. I would argue, however, that Farthing is not, perhaps, the best novel to be reading on the eve of an election about which one is particularly nervous. This page contains a single entry by Zach published on November 6, 2006 2:34 AM. One Tiny Political Post and That's It was the previous entry in this blog. Apolitical Politics is the next entry in this blog.